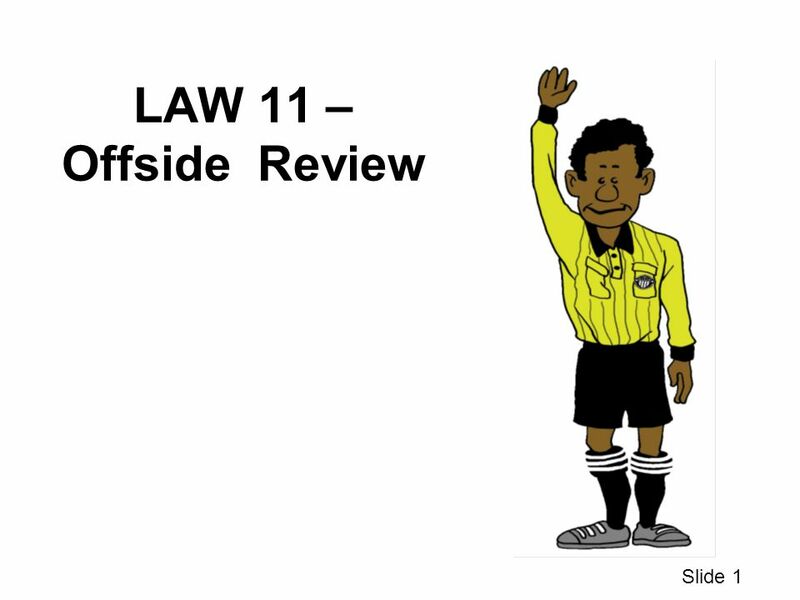 LAW 11 – Offside Review Slide 1. WHAT IF ??? 1 An attacker got the ball several yards past our second to last defender but the referee didn’t call offside. 2 WHAT IF ??? 1 An attacker got the ball several yards past our second to last defender but the referee didn’t call offside. Why? 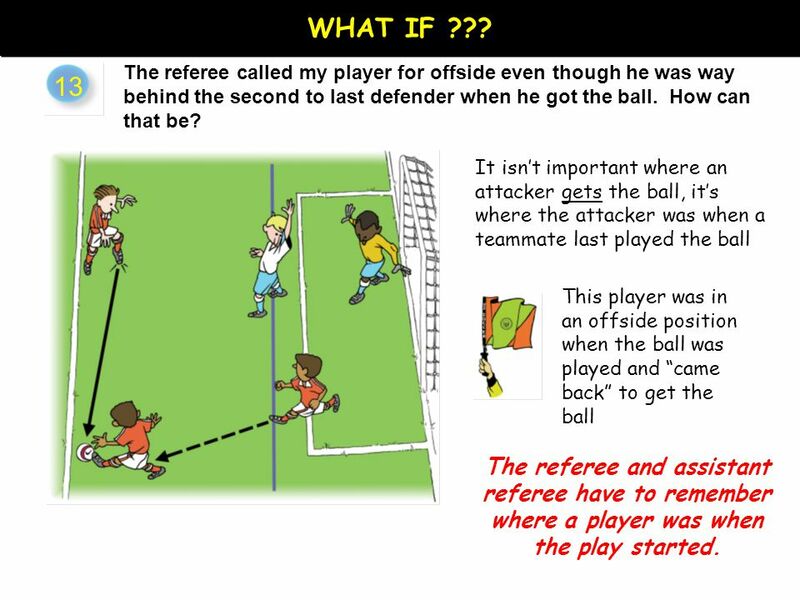 An offside position is not judged when a player “got the ball” but where the player was when the ball was played by a teammate. This is called “coming from an onside position”. 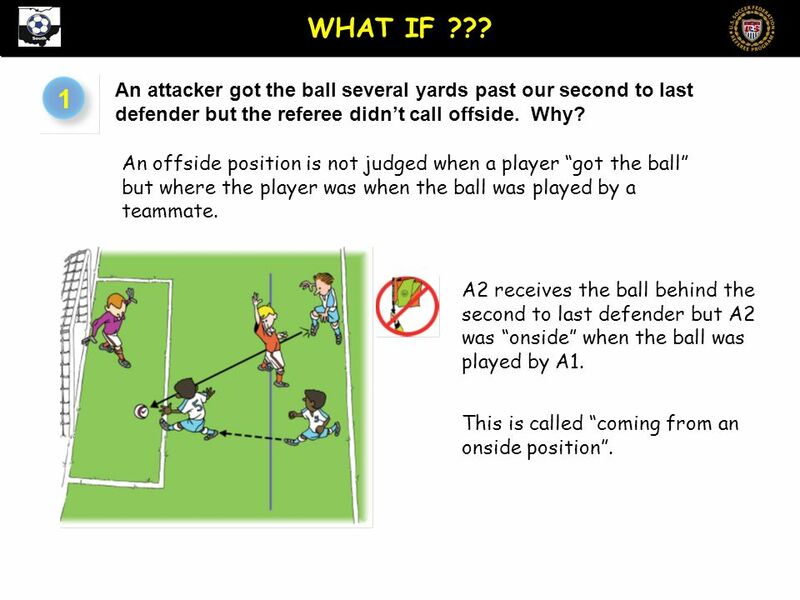 A2 receives the ball behind the second to last defender but A2 was “onside” when the ball was played by A1. 3 2 An attacker was clearly past the second to last defender when a teammate struck the ball directly into the net. The referee counted the goal. Why? 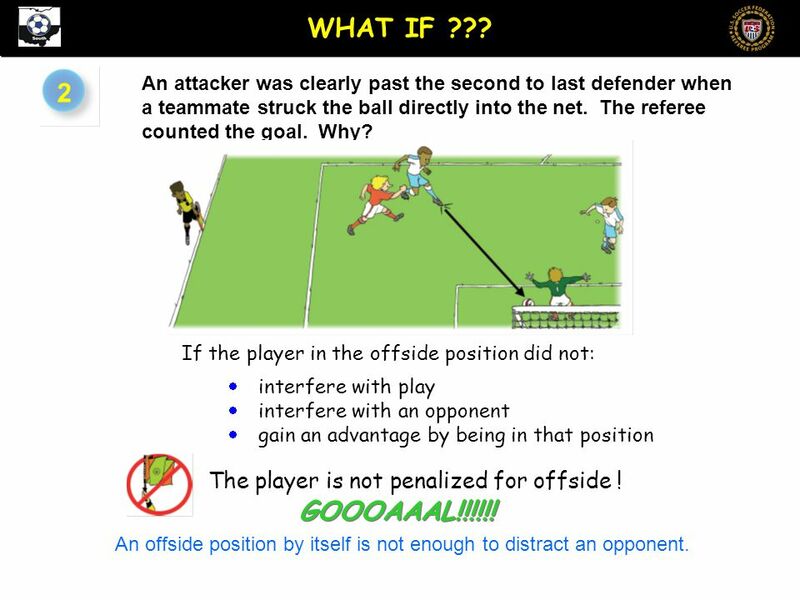  interfere with play  interfere with an opponent  gain an advantage by being in that position If the player in the offside position did not: GOOOAAAL!!!!!! The player is not penalized for offside ! An offside position by itself is not enough to distract an opponent. WHAT IF ??? 4 4 Player A1 is attacking with no defenders in front of him except the goalkeeper. Teammate A2 is following behind him. 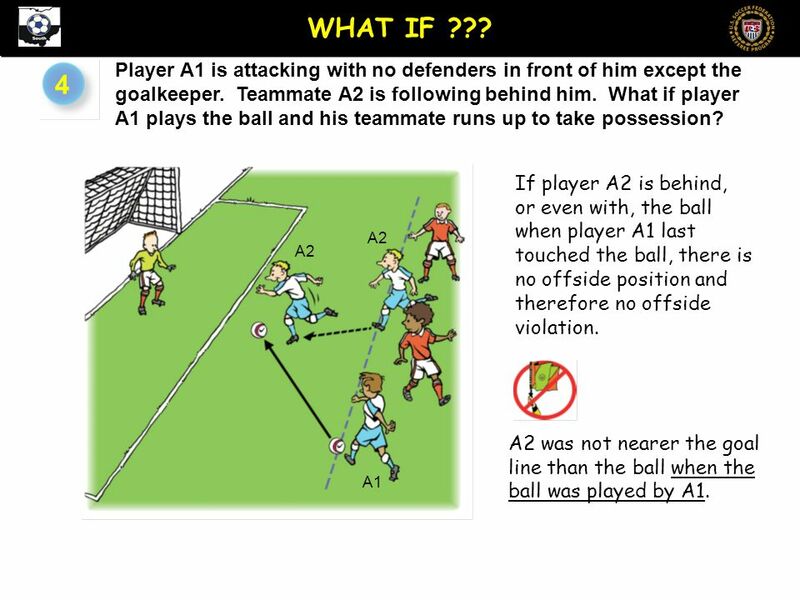 What if player A1 plays the ball and his teammate runs up to take possession? 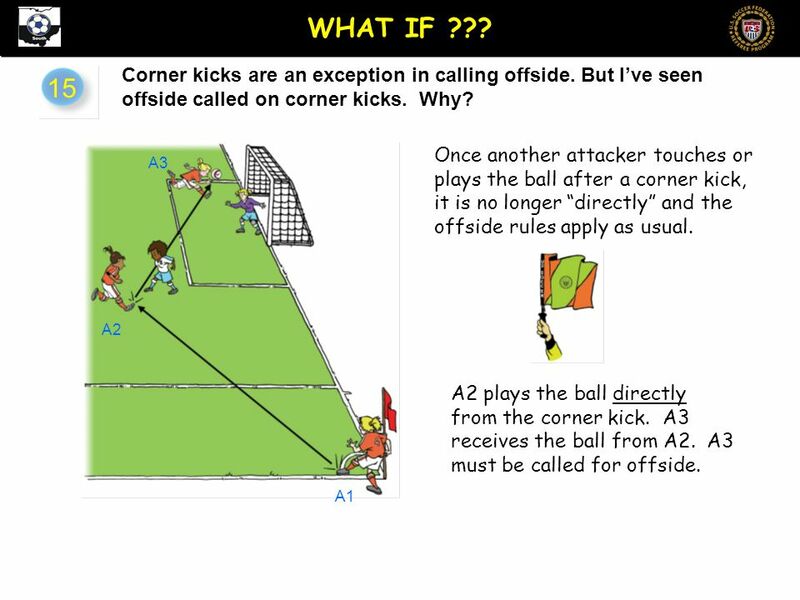 If player A2 is behind, or even with, the ball when player A1 last touched the ball, there is no offside position and therefore no offside violation. 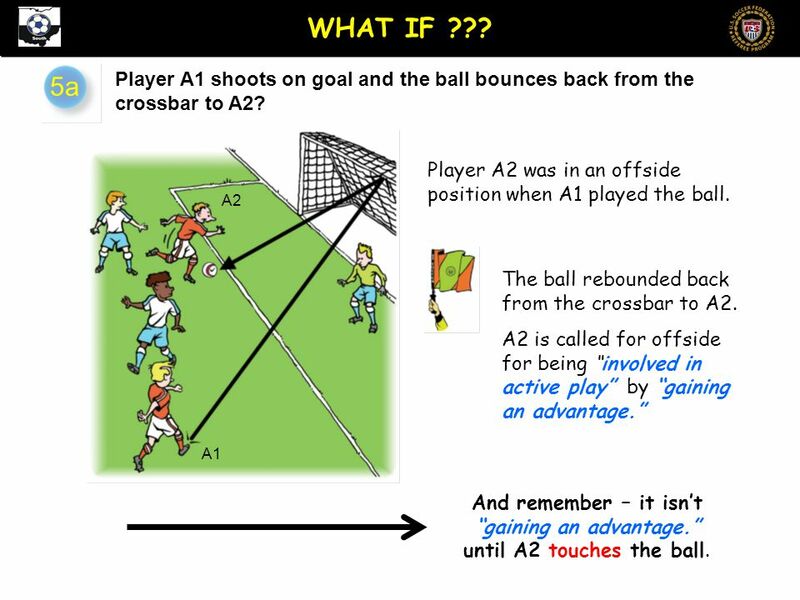 A1 A2 A2 was not nearer the goal line than the ball when the ball was played by A1. WHAT IF ??? 5 5a Player A1 shoots on goal and the ball bounces back from the crossbar to A2? A1 A2 Player A2 was in an offside position when A1 played the ball. The ball rebounded back from the crossbar to A2. 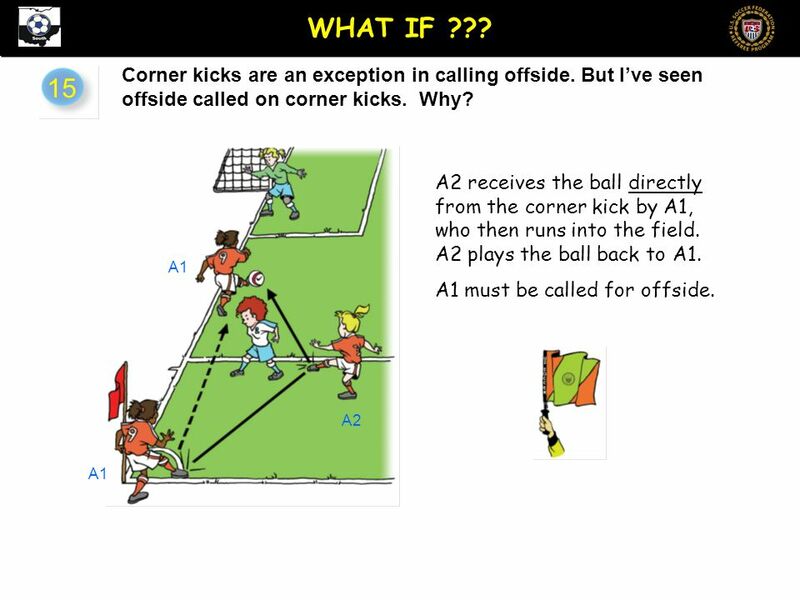 A2 is called for offside for being “involved in active play” by “gaining an advantage.” WHAT IF ??? And remember – it isn’t “gaining an advantage.” until A2 touches the ball. 6 Player A1 shoots on goal and the ball bounces back from the goalkeeper to A2? 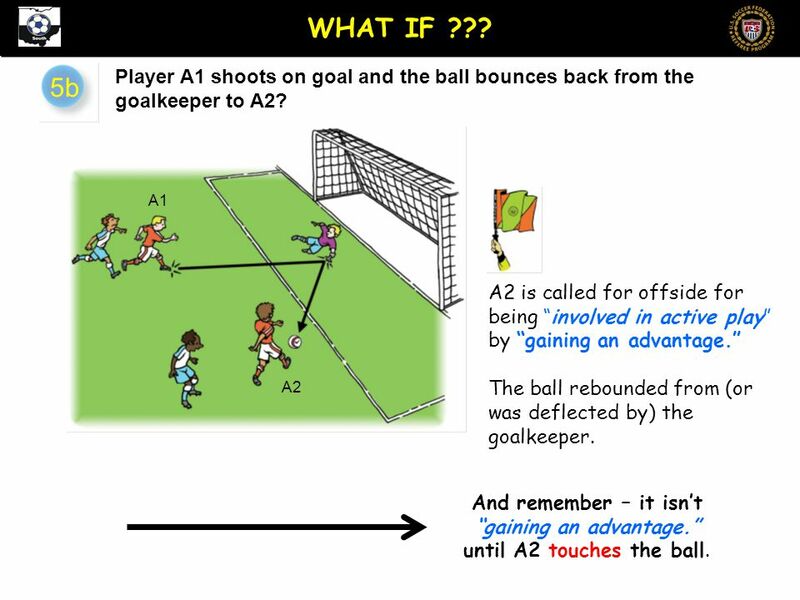 5b A2 is called for offside for being “involved in active play” by “gaining an advantage.” The ball rebounded from (or was deflected by) the goalkeeper. A1 A2 WHAT IF ??? And remember – it isn’t “gaining an advantage.” until A2 touches the ball. 7 7 Can an attacker step off the field to show that he is not participating in play? This is one of several ways an attacker can show they are not involved in active play. 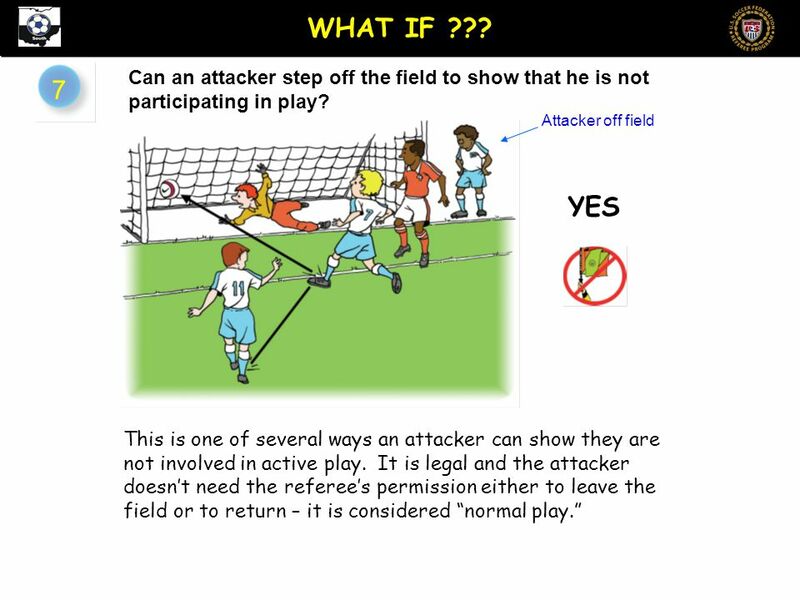 It is legal and the attacker doesn’t need the referee’s permission either to leave the field or to return – it is considered “normal play.” YES Attacker off field WHAT IF ??? 8 8a Can a defender step off the field to put an attacker in an offside position? This defender is counted as one of the last two defenders, even though he is off the field. Attacker #7 has two defenders in front of him. He is not in an offside position. 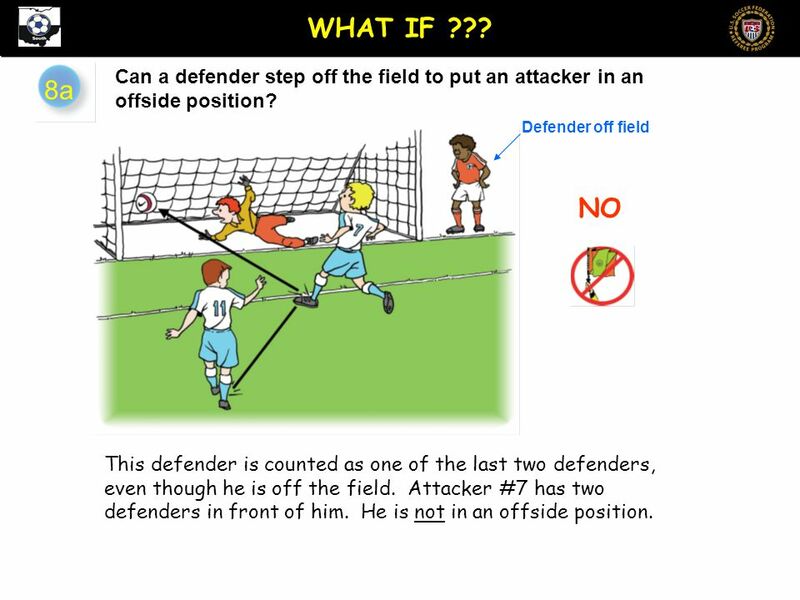 NO Defender off field WHAT IF ??? 9 11 Can a player be offside on a dropped ball?  Offside is judged only when the ball is touched or played by an attacker.  It is the referee who last touches the ball on a dropped ball restart so no one can be guilty of offside at that moment.  But, once the ball hits the ground, it is possible to be called offside if your teammate, who takes part in the dropped ball, then plays the ball to you. 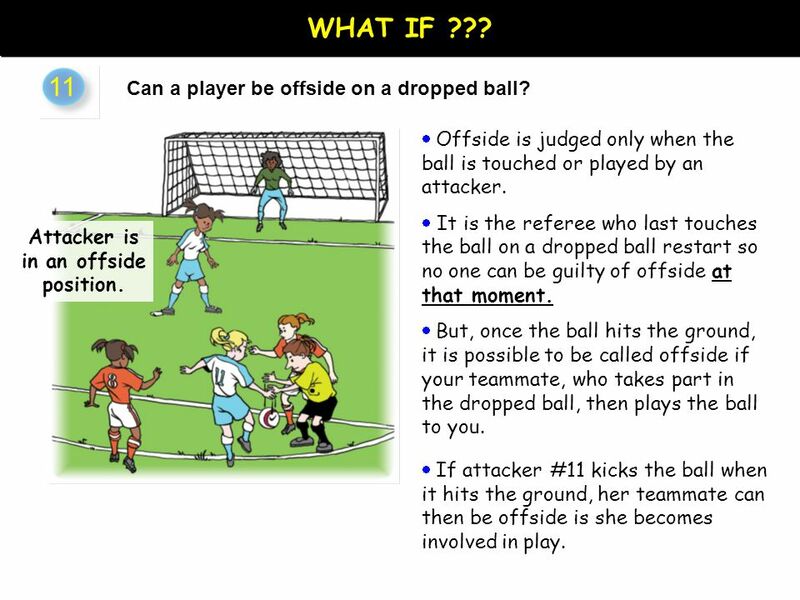  If attacker #11 kicks the ball when it hits the ground, her teammate can then be offside is she becomes involved in play. Attacker is in an offside position. WHAT IF ??? 10 13 The referee called my player for offside even though he was way behind the second to last defender when he got the ball. How can that be? It isn’t important where an attacker gets the ball, it’s where the attacker was when a teammate last played the ball This player was in an offside position when the ball was played and “came back” to get the ball The referee and assistant referee have to remember where a player was when the play started. WHAT IF ??? 11 Once another attacker touches or plays the ball after a corner kick, it is no longer “directly” and the offside rules apply as usual. Corner kicks are an exception in calling offside. But I’ve seen offside called on corner kicks. Why? A2 plays the ball directly from the corner kick. A3 receives the ball from A2. A3 must be called for offside. A1 A2 A3 15 WHAT IF ??? 12 A2 receives the ball directly from the corner kick by A1, who then runs into the field. A2 plays the ball back to A1. A1 must be called for offside. A1 A2 A1 15 WHAT IF ??? Corner kicks are an exception in calling offside. But I’ve seen offside called on corner kicks. Why? 13 United States Soccer Federation, Inc.
Download ppt "LAW 11 – Offside Review Slide 1. WHAT IF ??? 1 An attacker got the ball several yards past our second to last defender but the referee didn’t call offside." Laws of the Game Questions & Discussion November 7, 2012. LAW 15 THE THROW-IN. 5 TOPICS 1. Definition 2. Requirements 3. Technique u Hands u Location of feet u Restart u Placement 4. Referee procedures 5. Violations. Law 14 The Penalty Kick. 2 At the end of this lesson the student will do the following 3 things: Objectives 1.state when a penalty kick should be awarded. 2012 Mid Season Clinic Mid - Season Clinic Cones at the four intersections shall be considered out of bounds. Goal post on the goal line are considered. Module C -Game Scenarios- Ohio South 2014 Mod C In-Class Advanced Referee Recertification Training. Offside Examples Compiled by Richard Baker. Richard Baker Should we declare “B” offside? Or should we wait ? declare wait Diagram 1 B A. Wheelchair Tag Rugby League. Field Markings Referees There are 2 referees in charge of games - one on each touch line. Both Referees’ should have a whistle. Law 5 U.S. Soccer Federation Referee Program Advantage Update June 2012. Offside Examples. Should we declare “B” offside? Or should we wait ? declare wait Diagram 1 B A. Travel call – the toughest call in the game. Travel Rule 4-43 & 9-4. Law 15 The Throw-in. 2 At the end of this lesson the student will: Objectives state when a throw-in should be awarded state what constitutes a properly. 1 of 15Laws 13 and 14 Overview LAW 13 Free kicks LAW 14 Penalty Kicks An OVERVIEW. LAW 14 THE PENALTY KICK. 8 TOPICS 1. When to award a penalty kick 2. Before kick is taken 3. Kicker 4. Keeper 5. Other players 6. What if ….? 7. Extending. Law 16 Goal Kick. 2 At the end of this lesson the student will: Objectives state when a goal kick should be awarded state what constitutes a properly. 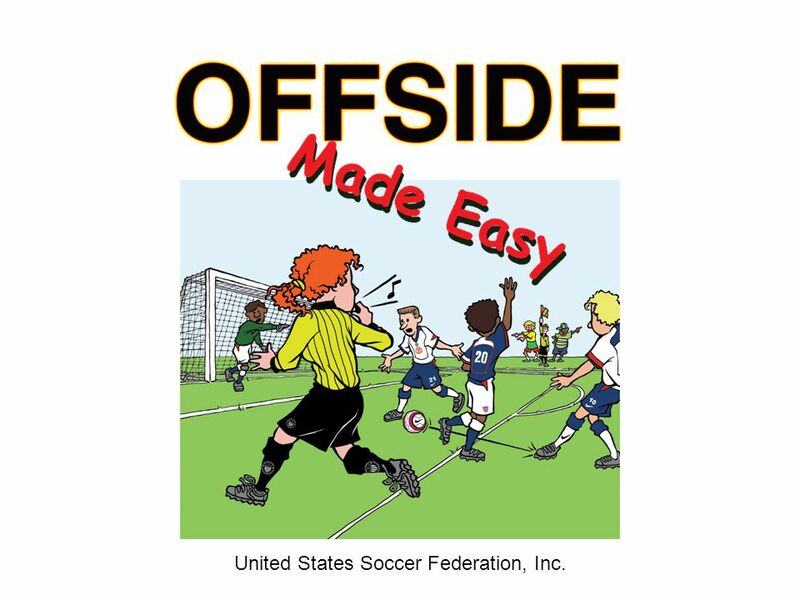 Slide 1 Offside Duties – 2014 CJK Offside Duties Judging Involvement in Play 2014 Ohio South Module “A” In-Class Intermediate Referee Recertification Training. Ohio High School Rule Differences 2014 Part 5 RULES 11 and 12 Dynamic Play.